Samsung is a pioneer in the mobile virtual reality market. Its consumer version of Gear VR is available for sale now just for $99. 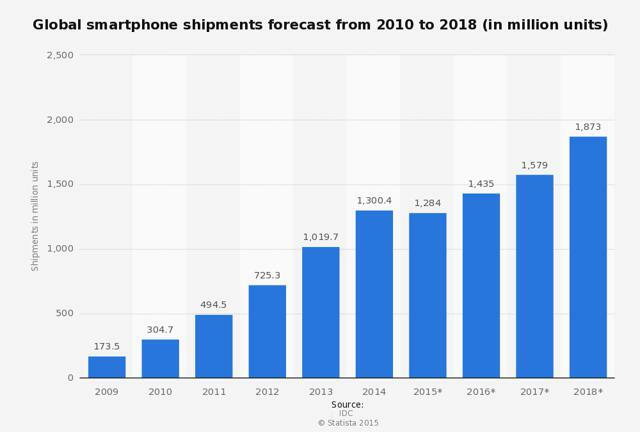 Increased shipment of smartphones, strong brand recognition and the rise of the VR market are the main catalysts for company’s growth. Currently, Samsung is a major manufacturer of hardware virtual reality devices for mobile customers. In November, Samsung (OTC:SSNLF) launched a new marketing campaign to promote its virtual reality device Samsung Gear VR. The campaign is a part of Samsung’s global initiative called It’s Not a Phone, It’s a Galaxy. The ad shows a wide variety of people that use Samsung Gear VR to watch a different kind of content that is available for the device. And the slogan is clear: Virtual reality just got real. And that’s true. Last year, there were a number of VR devices announced to be released anytime soon and “hungry” developers already started to explore this relatively new technology for their own use. Samsung’s Gear VR is one of the pioneers in this industry, with the consumer version available for sale now just for $99. This puts the company at the top of the smartphone VR spectrum in terms of quality and price. And considering the fact that Samsung has enormous resources and a properly-built ecosystem, it seems that its VR device will be there for a long time. If we look at the current virtual reality market, we would see that there are two different types of VR devices. The first ones are built for PC and consoles and offer a greater experience and a better graphics to the end user. However, they cost more and customers need a more powerful platform to use them. The examples are Facebook’s (NASDAQ:FB) Oculus Rift and Sony’s (NYSE:SNE) PlayStation VR. The second category of VR headsets is created for smartphones. They don’t offer the same quality of graphics and physics as VR devices from the first category, but they’re cheaper and more accessible for buyers. Samsung Gear VR fits into the second category and is compatible with all of the Galaxy smartphones. All you need to do is slip your phone inside the headset and you experience the world of virtual reality. The first consumer versions of the device were released last November and became one of the best-selling products on the market. Engadget called it a no-brainer and CNET said that it offers the best VR mobile experience so far. 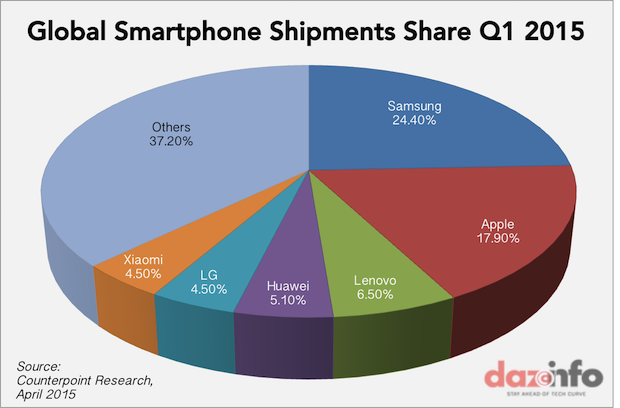 And the fact that Gear VR is comparable only with Samsung devices is not a big deal because the company has the biggest share of the smartphone market in the world and it seems that it will only expand further and increase the number of its users. And as we can see from the picture above, hardware will play a crucial role at the first stages of this fast-growing market. And the market is not that populated at the moment. Samsung’s main competitors in this field are private companies like Freefly, Noon, Zeiss and others. However, most of them are selling only online and don’t have the luxury to be available for sale at the major retail franchises. And Samsung’s ecosystem offers far more greater experience than all of those companies. At the same time, the competitors’ price is in the range of $70 to $120 and the quality of the product can be questioned. The last factor that plays an important role in Gear VR success is Samsung’s brand recognition. Long ago, the company established itself as a major player in the electronics market and people love to buy its products, thanks to the great quality and relatively low price. The virtual reality industry is just gaining traction. A lot of companies are already developing their own devices and hope to take some chunk of this fast-growing market. And while big tech giants like Facebook, Sony and HTC are making their product for the powerful platforms like the PC and next-gen consoles, Samsung is taking the most out of mobile customers. 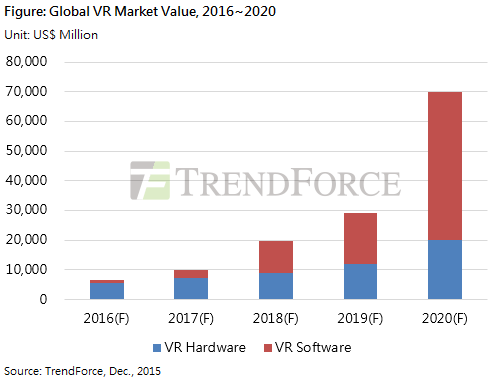 At this point in time, it’s important for the company to establish itself as a major manufacturer of hardware virtual reality devices. And that’s what Samsung is doing great at the moment. All of its headsets are already sold out and pre-orders are way off the cliff. With the strong presence in the industry, the company could afford to invite the best software developers to create content for the Gear VR. I believe that Samsung had a great launch for its VR device last November, and with the resources that they have and all of the catalysts that I described in this article, the company is poised for growth. The above article originally appeared on Seeking Alpha, written by Dana Blankenhorn. NINTENDO’S new NX console could have a big say on whether you buy a 4K TV in the future. More information supposedly connected with the Nintendo NX project has surfaced today, revealing more on what the new console could be like. A list of new details have appeared on Reddit, from a verified Reddit user by the name of UntypedHero. For those who want to know, the Reddit moderators of the board say they have been able to verify that the poster has got connections with Nintendo development. According to this new report, the Nintendo NX will include a wide range of compatibility options and be able to handle ports of current-gen titles, although no specific stats were included. One of the most interesting titbits of information given to us from UntypedHero concerns the NX’s potential to output games at 4K, which could prove as stiff competition for the promised 4K ready PS4 that’s also supposed to launch this year. • The retail name for the NX is unknown to developers (or they are holding back). I’ve asked multiple sources. • I know of at least 1 third-party Wii U game that has/have been successfully ported to NX. • Amiibo are still supported (if you hadn’t already guessed). • Friend codes are still a thing (unfortunately). • I don’t know when the NX will be announced. Speculation is this month. • There are multiple “gimmicks” with the NX, one is optional. • There are physical dev-kits out in the wild, I don’t have access to these. • I don’t know the model of the GPU, however there is little doubt (from what I’ve been told) that it an AMD. • The NX is capable of outputting 4k. Consensus is up-scaling and streaming. As with every rumor it’s still worth taking everything with a pinch of salt until Nintendo confirm these details themselves. This follows news last week that the new-look revamped Playstation 4 and Nintendo’s secretive NX console will both release before Christmas. That was the verdict of industry insiders after computer maker AMD announced custom chips for both machines were being prepared for 2016 releases. Playstation is so far refusing to publicly announce its revamped PS4K machine – which is rumored to come with a new God of War game. But leaks have suggested it will launch with double the graphics power of the current PS4 and 4K video capability. That means images will be up to four times better than the current 1080p HD quality of most flat screen televisions. Nintendo Mobile: Miitomo, A Sign Of Things To Come? Miitomo released in Japan and 1 million users signed up in the first 3 days. Miitomo is unconventional and will be an excellent marketing tool if global downloads are strong. We still need to see a traditional Nintendo game on mobile with proper monetization. Nintendo’s(OTCPK:NTDOY) long anticipated first mobile app was released in Japan on March 17th. Miitomo, a social networking app, garnered over one million users in Japan within three days of launch. As I write this article, NTDOY is up 5.5% with the share price rise driven apparently by the bullish adoption figures and the clear power of the Nintendo brand in the mobile space. This is good news for NTDOY investors as the mobile strategy is in the very early phases and the pent up demand for Nintendo on mobile is massive. Miitomo is an odd thing– not really a game, and not really a proper social network either. The easiest way to explain Miitomo is that it is a new version of Tomodachi life with a larger potential user base and mobile phone connectivity. You start by creating a Mii avatar and answering some random personal questions. You can add friends from your other social networks such as Twitter and Facebook. Your avatar and your friends avatars interact and ask each other questions in sort of a “virtual life” simulation. Interactions earn you coins which you can spend on in game items like clothing or accessories for your Mii avatar. Additionally, there is a pachinko like mini game which uses in game coins as well as a photo application that allows you to incorporate your Mii into real world pictures you take with your phone. Photos are stored on Nintendo’s servers and not on your phone. For more detail I strongly suggest you take a look at this article which has an excellent summary of the app. In app purchases are free, but you can buy more coins with real world currency. Nintendo has stressed that users do not need to spend real world currency to get a full experience in Miitomo. This is good to hear as a predatory monetization strategy would surely limit widespread adoption of Nintendo’s mobile offerings. How does Miitomo fit in with the broader mobile strategy? Miitomo is an interesting choice for the first mobile application released. Tomodachi life was not a major success, but it sold reasonably well at +3 million units sold globally. There is potential for Miitomo to perform far better and reach a vastly larger audience given the app is free and available on iOS and Android to hundreds of millions of mobile phone users. Purely from curiosity and familiarity with the Nintendo brand, many will download the app just to check it out. If the experience is interesting and offers enough social network “stickiness” some might even hang around and spend some money. Miitomo will be successful at pulling in users to the Nintendo mobile ecosystem and will generate buzz in social media to increase awareness of future Nintendo mobile titles. In a sense, Miitomo is a marketing tool for Nintendo to lay the early foundation of their mobile strategy. I do not believe it will be a major contributor to revenues or profits, but if leveraged successfully when the big name mobile games are released, Miitomo will be the platform that drives the hype and generates consumer awareness. Nintendo still needs to release an actual mobile game incorporating their primary IP. Miitomo feels like a small thing designed to help market the brand and build up an early user base. If one million users have already signed up in Japan, imagine what an actual Mario title will do if released into the mobile platform. I remain very bullish about Nintendo as they are sitting on a gold mine of IP and backlog that will be incredibly profitable if they can execute an effective mobile strategy. The share price is up as of today, but there is still significant upside potential with the impending release of major information on the NX as well as the lineup of future mobile games. Expect major news around E3 in June which will certainly drive the share price higher. Much has been rumored about new consoles from Nintendo and Sony. Both Japanese companies have been secretive about their plans for their new game systems. In Nintendo’s case it’s the NX, a console that’s seen its fair share of speculation with everything from resolution and frame rate to well-orchestrated fake controllers. As for Sony, since GDC 2016 we’ve seen more than a few murmurs of a PS4K – allegedly a souped-up version of the PS4 for gaming at higher resolutions and for enjoying enhanced VR. With Microsoft’s Phil Spencer quashing all rumors of an incremental Xbox One, that effectively rules it out. Considering that AMD’s chips have been powering all three consoles makers, it leaves both Nintendo and Sony with products to showcase.